A new study serves up details on the economic contributions from a good news sector – that is, the oil and natural gas industry – during a period when the overall economy has under-performed. PricewaterhouseCoopers LLP authored Impacts of the Natural Gas and Oil Industry on the U.S. Economy in 2015 for API. As made clear in the report, the impact of the oil and natural gas sector flows throughout the entire economy, and across the nation. However, there’s more to this story, as it’s important to note that nearly every industry included in this study is largely populated by small businesses. Considering the full impact of the sector, PWC reported that oil and natural gas supported 10.3 million jobs, or 5.6 percent of U.S. total employment, in 2015. It’s impact on labor income (including salaries, wages and proprietors’ income) registered $714.2 billion, or 6.7 percent of the U.S. total, and accounted for $1.3 trillion, or 7.6 percent, of U.S. GDP in 2015. 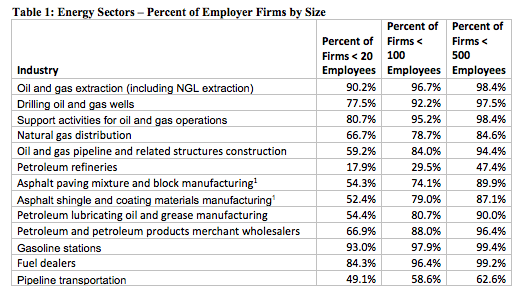 This study notes that the oil and natural gas sector encompasses 13 industries. Most of these 13 industries (12 out of 13, with a still significant level of small business activity in the 13th), according to the latest Census Bureau data (2014), and as noted in Table 1, are overwhelmingly populated by small businesses. The energy sector plays a major role in our economy, as the PWC report makes clear. 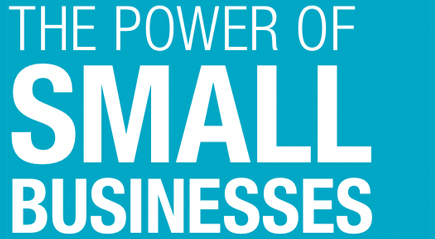 In turn, small businesses play a big role in the energy sector in terms of innovation, competition, quality job growth, investment and their economic contribution to local communities.